For years, scientists and engineers have synthesized materials at the nanoscale level to take advantage of their mechanical, optical, and energy properties, but efforts to scale these materials to larger sizes have resulted in diminished performance and structural integrity. Now, researchers led by Xiaoyu "Rayne" Zheng, an assistant professor of mechanical engineering at Virginia Tech have published a study in the journal Nature Materials that describes a new process to create lightweight, strong and super elastic 3-D printed metallic nanostructured materials with unprecedented scalability, a full seven orders of magnitude control of arbitrary 3-D architectures. Strikingly, these multiscale metallic materials have displayed super elasticity because of their designed hierarchical 3-D architectural arrangement and nanoscale hollow tubes, resulting in more than a 400 percent increase of tensile elasticity over conventional lightweight metals and ceramic foams. The approach, which produces multiple levels of 3-D hierarchical lattices with nanoscale features, could be useful anywhere there's a need for a combination of stiffness, strength, low-weight, high flexibility—such as in structures to be deployed in space, flexible armors, lightweight vehicles and batteries, opening the door for applications in aerospace, military and automotive industries. Natural materials, such as trabecular bone and the toes of geckoes, have evolved with multiple levels 3-D architectures spanning from the nanoscale to the macroscale. Human-made materials have yet to achieve this delicate control of structural features. "Creating 3-D hierarchical micro features across the entire seven orders of magnitude in structural bandwidth in products is unprecedented," said Zheng, the lead author of the study and the research team leader. 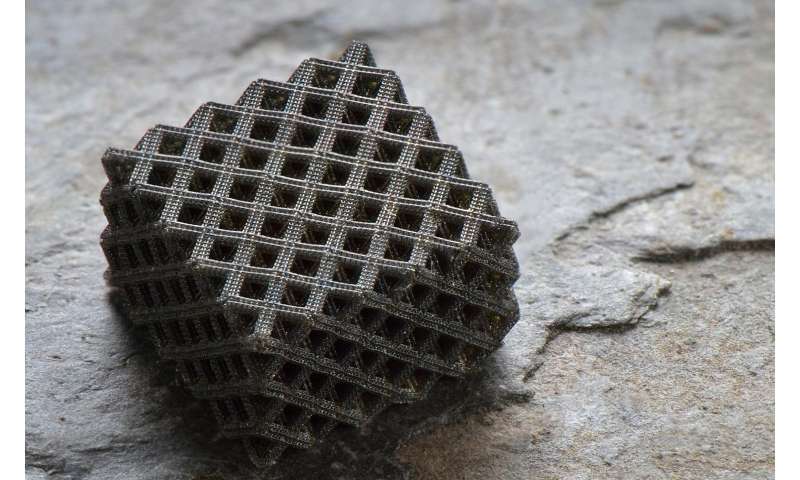 "Assembling nanoscale features into billets of materials through multi-leveled 3-D architectures, you begin to see a variety of programmed mechanical properties such as minimal weight, maximum strength and super elasticity at centimeter scales." 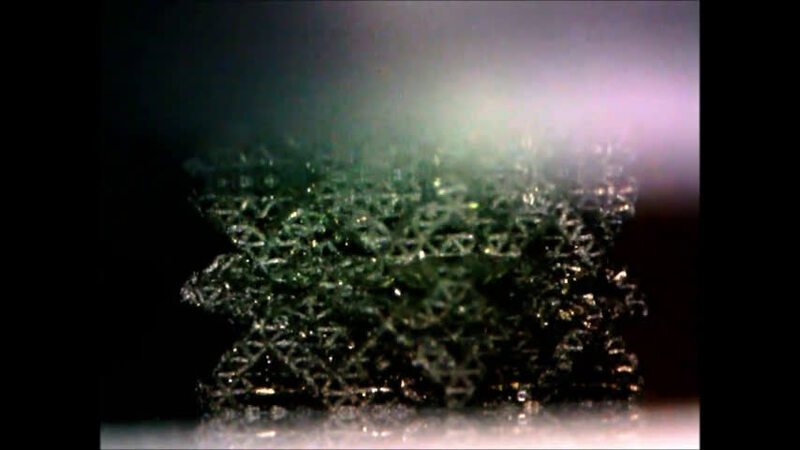 The process Zheng and his collaborators use to create the material is an innovation in a digital light 3-D printing technique that overcomes current tradeoffs between high resolution and build volume, a major limitation in scalability of current 3-D printed microlattices and nanolattices. Related materials that can be produced at the nanoscale such as graphene sheets can be 100 times stronger than steel, but trying to upsize these materials in three dimensions degrades their strength eight orders of magnitude - in other words, they become 100 million times less strong. "The increased elasticity and flexibility obtained through the new process and design come without incorporating soft polymers, thereby making the metallic materials suitable as flexible sensors and electronics in harsh environments, where chemical and temperature resistance are required," Zheng added. Besides Zheng, team members include Virginia Tech graduate research students Huachen Cui and Da Chen from Zheng's group, and colleagues from Lawrence Livermore National Laboratory. The research was conducted under the Department of Energy Lawrence Livermore Laboratory-directed research support with additional support from Virginia Tech, the SCHEV fund from the state of Virginia, and the Defense Advanced Research Projects agency. Holy crap this is awesome. Would love to work or study with this guy or even in this field. DARPA will be able to finish its development of a Nano-Metric DNA sniffing drone swarms, for finding known enemies. Such as Obama. Now you can Hide and Run, but you cannot get away from DARPA.